BRCA 1 and BRCA 2 are genes, that when working normally, prevent cancer by repairing DNA. When there is a mutation, these genes don’t work, and cancer is more likely to develop. These mutations are inherited in an autosomal dominant fashion from a parent who carried this mutation—either father or mother. What that means is that if your parent has a BRCA mutation, you have a 50% chance of inheriting this mutated gene. And if you carry a BRCA mutation, your child has a 50% chance of carrying the same mutation. 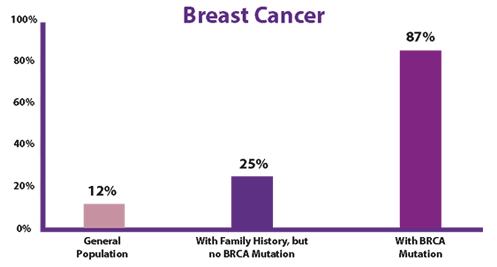 In the general population, the chance of having a BRCA mutation is not very common, approximately 1 in 300 to 800 people. However, the chance of having a BRCA mutation in Ashkenazi Jews is 1 in 40, or 2.5%, independent of family history of cancer. The incidence of carrying a BRCA mutation is the same for both Ashkenazi men and women. Why are BRCA genes important? Men and women who carry a BRCA mutation can have a markedly higher lifetime risk of cancer, and these cancers can develop at earlier ages. For example, women who carry a BRCA mutation have up to an 85 + lifetime risk of breast cancer, and up to a 50% lifetime risk of ovarian cancer. Men who are BRCA positive have up to a 30% risk of developing prostate cancer, as well as an increased risk of male breast cancer. 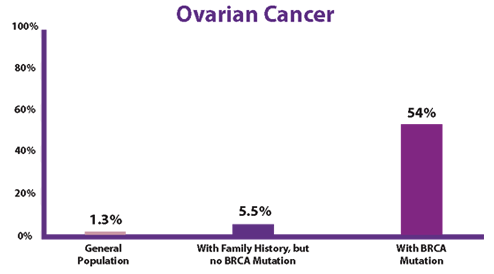 Other cancers, such as pancreatic cancer and melanoma can also be seen in BRCA mutation carriers. Who should be tested for BRCA mutations? Yodeah believes all Ashkenazi Jews should be tested for BRCA mutations. Current guidelines recommend Ashkenazi Jews be tested for a BRCA mutation only if there is a family history of breast, ovarian or pancreatic cancer. This is not adequate. Medical studies show when we limit testing to Ashkenazi Jews only with a family history, we miss most of those people who may carry mutations. Cancer prevention. We can prevent cancer, but to do so we must identify who carries a BRCA mutation before cancer develops. In BRCA mutation carriers, there are established medical guidelines for increased surveillance to help diagnose cancer at its earliest and most treatable stage, procedure recommendations to decrease the risk of developing these cancers, and even provide medicines that can help prevent cancer. A couple in which one carries a BRCA mutation can also undergo in vitro fertilization with preimplantation genetic diagnosis to prevent their children from carrying a BRCA mutation. What about other Jewish genes that increase the risk of cancer? There are other genes in both Ashkenazi and Sephardic Jews that can increase cancer risk for which closer cancer screening is recommended. For example, there is a common gene that is carried by up to 10% Ashkenazi Jews that slightly increases the risk of colon cancer. Another gene more common in Ashkenazi Jews increases the risk of Lynch Syndrome, a syndrome associated with colon, endometrial and ovarian cancers. There are also mutations on various genes that are more common in the Sephardic Jewish population. For example, 1 in 80 Sephardic Jews carry a mutation on the ATM gene, which is associated with an elevated risk of breast cancer.